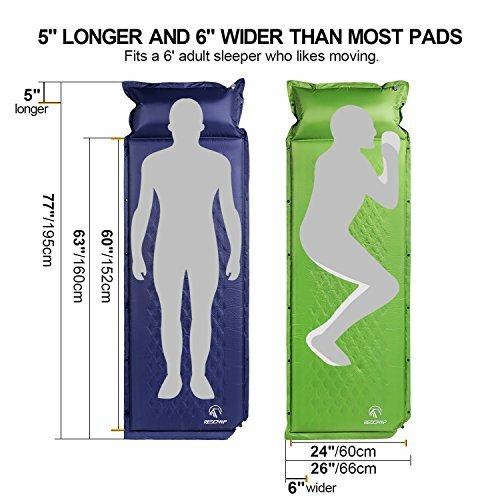 Best Self Inflating Sleeping Pad For Camping – Get A Good Nights Sleep! When you’re out camping, you don’t expect to be as comfortable as you would be at home. That being said, there are a few ways you can ensure your trip is as comfortable as possible. One of the ways you can do this is by purchasing the best sleeping pad you can afford. A quality self inflating sleeping pad will also take up less room and pack smaller. You can either combine a sleeping pad with a camping cot and sleeping bag for the ultimate sleeping system. However many will simply lay them on the tent floor. For the sake of these reviews we’re presuming that’s the case. With that in mind a good pad will insulate from the floor and provide a degree of comfort. As these pads are the self inflating variety you won’t have to worry about blowing them up, especially when you’re already tired from making your way to your camp site. All you need to do is lay it out and enjoy a peaceful rest when it’s time for bed. Nobody wants to have to sleep on the hard floor and carrying a full on bed with you when you camp can be heavy and impractical. 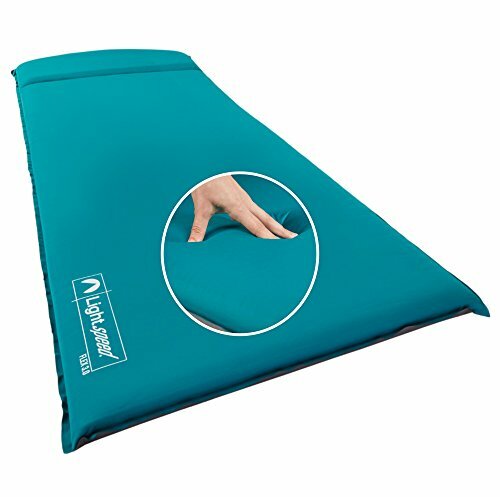 If you want to minimize hassle when camping, a self inflating sleeping pad can help you do just that. This pad claims to leave you refreshed when you wake. The company are so confident that you will have a good night’s sleep that they have a money back guarantee if you don’t feel like you’re satisfied. Of course they know that very few will actually take them up on that promise. We all know that good sleep is dependent on lots of factors not just a decent sleeping pad. Having said that the pad is extremely good value for money. To say it’s only 1.5″ thick users report that it rides out ground unevenness well even if you’re on the heavy side and sleep on your back. However side sleepers putting more pressure into the center of the pad might find that it makes little difference to sleeping on the floor. 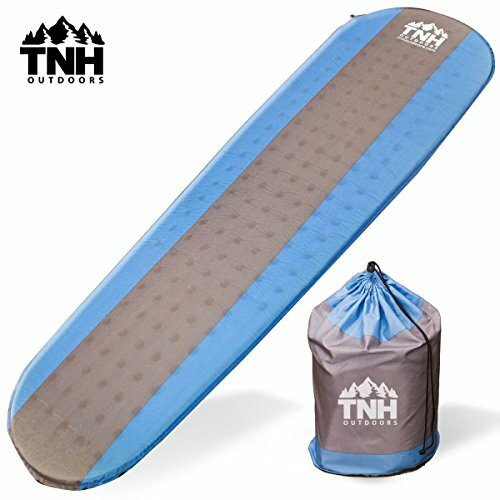 Overall the TNH Outdoor is a comfy pad for a solid price. 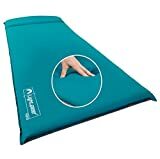 It will fit in a small bag with the rest of your camping gear perfectly, and is cheaper than many lower quality sleeping pads. The only issues you may experience are inflation and weight. It isn’t too heavy and these reviews are squarely aimed at car campers but if weight is important to you, perhaps you’re a backpacker, then there are lighter alternatives. That being said, the quality of materials and construction make up for this. Inflation may be difficult for some though most find it easy. Just give it a few extra breaths to ensure it’s fully inflated. You have to watch that the ‘O’ Ring on the valve is properly seated otherwise it can make inflation and deflation problematic. 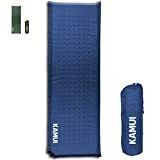 Overall this is a great value for money sleeping pad that most will love though side sleepers might be better looking for something thicker. This is an overall good product, especially for the price. However, the only issue many have with the Redcamp is that it will not hold air sometimes, stopping it from inflating fully. It also may not be as comfortable as other options for those who need joint support, and the fact it comes with no instructions throws many people off. Although this is a decent sleeping pad at the end of the day, the cons could make it hit and miss for some campers. 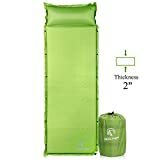 REDCAMP Self-Inflating Sleeping Pad with Attached Pillow, Compact Lightweight Camping Air Mattress with Quick Flow Value, Green 77"x26"x2"
This Coleman sleeping pad is potentially OK for a casual camper, however, it is not the most well-made pad on the list. If you get sent a good one, then you may enjoy a comfortable sleep at a cost effective price. However, if you get sent a faulty one like many others, you may end up with a sleeping pad that was only good for one use. You will likely get a better quality pad for the same price or cheaper, so bear that in mind! Overall, this is a great sleeping pad for car and family camping. However, it’s probably not the best if you’re an avid backpacker. The Kamui pad is affordable and there are few negatives you can levy at this pad. A customer will only very rarely be sent a defective pad according to Amazon reviews. 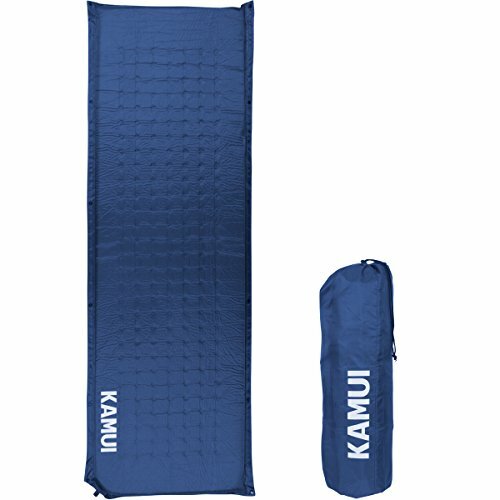 As the customer service is great, this could make a great investment for somebody who wants an affordable, comfortable sleeping pad for car and family camping. Just avoid it for backpacking! The Lightspeed pad comes as a highly recommended pad. Almost everybody who tries this pad gives it 5 stars. We think that it’s the closest you’ll get to glamping while being out in the wilderness. It’s extremely comfortable, even for older people who may need more support on their joints. Side sleepers can sometimes find it difficult to find a comfortable sleeping pad, but this pad does the job. We really have nothing bad to say about this pad – looks like you get what you pay for! Conclusion – Which is the Best Sleeping Pad of the Bunch? By now, you may have made your own mind up about the winner. However, we have taken our time, poured over reviews, and we think that the clear winner is the Lightspeed Self-Inflating Sleep Pad. Although this pad is a fair bit pricier than others on the list, you definitely get what you pay for. 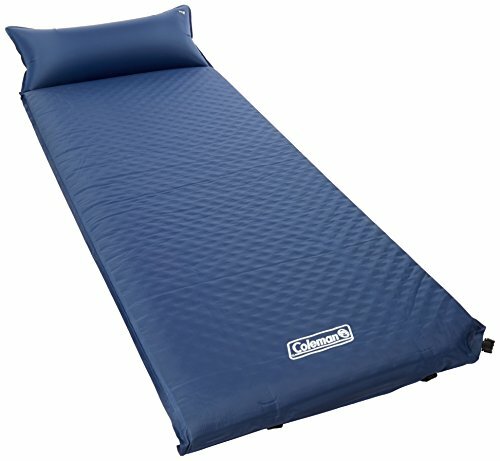 If you’re a serious camper and you want something comfortable, reliable, and durable, then this is the sleeping pad for you. You just have to feel confident spending the amount of money asked! However, some people will prefer a more cost effective option when it comes to finding the right sleeping pad. 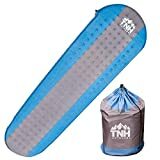 In this case, the runner up is the TNH Outdoors sleeping pad. For half the price of the winner, you’ll still get a great quality sleeping pad. It may not last as long or be quite as flawless, but it will still be a great investment! Plus, you pretty much have nothing to lose with the money back guarantee that the company offer. Although the two above pads are great, other pads on the list can still make a brilliant investment, depending on your reasons for camping, who you are camping with, your budget, how serious you are, and more. Be sure to weigh up the pros and cons yourself so you can purchase the right pad for you. If there’s a pad to avoid, it’s probably the Coleman Self-Inflating Camp Pad with Attached Pillow. Although it’s cheap and many say that it’s comfortable, it’s hit or miss with the quality. The straps aren’t great and many find they rip off after the first use. This could be an OK pad for the casual camper, but you will likely be able to get a better quality pad that will last longer for a cheaper price! Hopefully, these reviews have helped you to find the perfect self inflating sleeping pad for your camping requirements. Whatever your budget, whoever you are camping with, and whatever your reasons, we know there’s something on the list to suit you. Which will you invest your money in?